"...Under Elina de Santos’ breezy direction, the fine performances and a strikingly original premise peel away layers of high-tech artifice to find the human heart alive and well." "...Director Elina de Santos sharply keeps the preposterous action moving with edge-of-your-seat tension throughout. (Not preposterous if you believe in future advancements, or if you believe in Frankenstein) Letscher's script, full of nice details making sense of everything (or at least plausible), stirs up many questions. Like what does "Til death do us part" really mean in this instance? Is Sandy 'free' to move on to a relationship with Vic? Or would she be adulterous to the revived Ron? Like if you could bring back your loved one from the dead, would you? Who gives one the right to play God? Would you then create/clone a creature with features you think are perfect? Does one have to be unhinged to be a genius?" "...In the end, it isn't just Ron's intelligence that is artificial. The emotional underpinning of the show isn't grounded in authentic emotion or concern for what makes people love one another and what keeps families together or breaks them apart. On the way out of the theater, I overheard some of the older audience members talking about how timely the subject matter is. On the surface it may seem so, but at its heart Smart Love doesn't strike me as particularly forward looking." 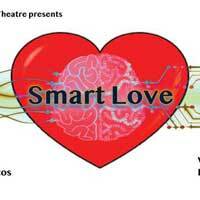 "...SMART LOVE is a thought-provoking piece (between laughs, of course) which is tailor made for today’s science – and all the ethical and practical questions which current invention may entail. But it’s really hard to ponder such weighty considerations with all the hilarious shenanigans going on. The cast is letter perfect in conveying their emotional roller coaster rides through today’s digital world. " "...The main problem, however, is that this show depends on the audience's investment in a relationship that is literally dead by the time they're introduced to it. It's discussed at length in the past tense, which automatically distances the viewers and ultimately makes the emotional catharsis at the play's conclusion feel unearned."